VILLA VALENTIN in Sayulita is located just 3 minutes drive from town and is the perfect tranquil, luxury destination for your Sayulita family vacation or group retreat. The Villa Valentin estate accommodates 18 guests and consists of the main Casa Valentin, as well as two Casitas, Azul & Roja. This small resort is surrounded by 2 acres of lush jungle with expansive views of the Pacific Ocean which makes it a perfect place to enjoy the peace, quiet and privacy for your perfect, hassle-free vacation! "The property is stunning, the on-site staff is exceptional and the views are breathtaking." 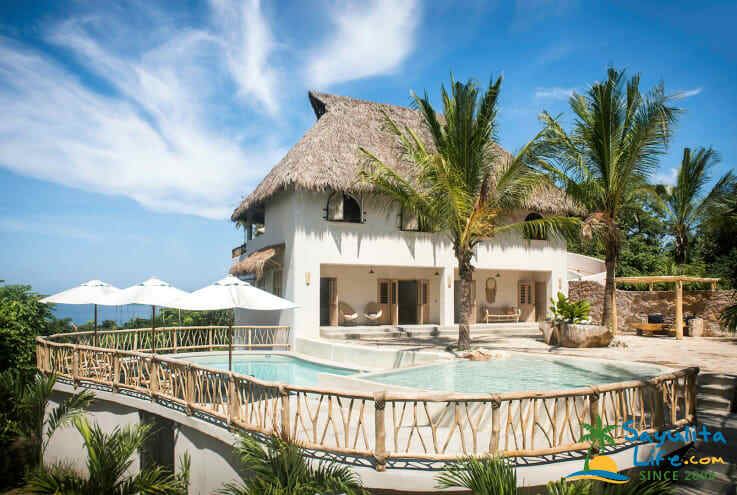 The luxurious 4 bedroom/4 bathroom main casa with massive open and soaring palapa roof is beautifly decorated with hand painted blue tiles contrasting with the Pulido mosaic floors which span the living area and terraza. The impressive native wood table hosts a dinner for up to 16 guests with views of the jungle and Pacific. Light and airy double bedroom with queen bed opens out to the adjacent living area. Divided into 3 large King bedrooms downstairs area includes en-suite bathrooms, a spacious lounge with a small kitchen, dining table and TV. Additional bunk beds set up in one of the bedrooms. Main doors opening onto the pool terrace gives natural ventilation flows from the ocean view decks of each room. Amazing master suite has views to Monkey Mountain and an open air bathroom looking towards to ocean. We got married at Villa Valentin and stayed on property for 5 days. I cannot recommend this property enough. The property is stunning, the on-site staff is exceptional and the views are breathtaking. Perfect for a wedding or for a family / friends getaway. Super close to Sayulita town center but tucked away into a jungle setting. The property is aesthetically pleasing and you feel completely at easy. Our wedding was a complete dream and big thanks to Villa Valentin for that. Love Villa Valentin! We stayed at the villa for three weeks with different family members coming and going as they were able to. The villa was perfect. The young people loved sayulita. I loved San Pedro which is only a few minutes up the road. The villa is gorgeous spotlessly clean with great staff. It’s also a perfect combination of half hotel and half private home with all the house work done. I really liked that because once the staff all left after the morning clean you have the place To yourself. I also love the style and vibe of the place it is so cool. The views are gorgeous the weather was fabulous the cocktails were terrific. I can’t recommend it highly enough. literally the most amazing place I’ve ever been. The town is vibrant and quaint. The villa is the perfect balence of privacy and service. Could not recomend moee! After a hectic few months of work and school we gratefully arrived in the surfy, colourful, vibrant town of Sayulita and the exquisite, breathtakingly designed and crafted, boho oasis that is Villa Valentin. We knew it was beautiful from the photographs but even the clever marketing and social media can’t do it justice, such is the beauty and magic of the place. We were there for a short, family holiday to unwind. And the wonderful Conrad and Katherine, Emiliano and the whole VV team couldn’t do enough for us. They were kind and nurturing, fussing over our every need and making everything happen effortlessly so we didn’t lift a finger. The owners organised a nifty little golf cart for us to get around, they advised us on the best massages and fish tacos in town, where to go surfing, highlighting the incredible wildlife and nature of the area, taking us on walks in the jungle and to private, sun-drenched, white sand beaches. The owners also cooked dinner for us twice; really beautiful delicious salads and freshly caught fish. Nothing was too much trouble. Even when I had a tummy upset from one of the restaurants in town (Don Pedro's) the owners cracked coconuts to serve me the natural healing properties of the coconut water and took us to an organic juice bar in Sayulita to feel better. The lovely and efficient Emiliano also gave us a Mexican history lesson, making it interesting for the kids and bringing alive the Aztecs and Mayans to enthral and educate. And he recommended local products to taste and try, making sure we made the most of our Mexican adventure. Wonderful. Perfect get away for groups or large families. Villa Valentin is incredible, and so much more than the photos! Loved the large open casa, intimate colourful casitas, with their beautiful palapas, Mexican artwork, panoramic views, and thoughtful architecture/interior design. The size and layout of the property meant we could be alone, be together or somewhere in between and be perfectly content. The jungle setting is lovely, and the pool is perfect. The staff (esp. Emiliano and Moises) were very attentive and helpful from morning breakfast to evening Margaritas, and arranging extra services for us was no problem at all. Set slightly inland, the location is ideal. While providing fantastic views and privacy it was just a short (and fun) golf cart race down to the beach and town. We felt very secure and special. Katherine and Conrad, Villa Valentin is wonderful. You have outdone yourselves with employing fantastic people, decorating with an artists eye, and creating a wonderful estate to venture out from. We are thankful for your hospitality, your generosity and for sharing the paradise you found, cultivated and nurtured, with all of us! Having travelled extensively throughout Mexico on business and vacations, I have stayed in some great places and some dives. Villa Valentin was the best Mexican accommodation I have ever experienced. The location is great - set in the tranquil tropical jungle above Sayulita, its a 5-minute golf cart ride to town or the beach. Sayulita itself is a special place. A bustling little town, still authentic Mexican, safe to wander throughout, with great food, beaches, surf and snorkelling nearby. The cool thing about Villa Valentin is that you can also get away from town/beach when you've had enough. We visited in July, so things were pretty hot and the air-con casitas and pool were a welcome respite for the afternoon. The Casa design and appointments are amazing, high brick ceilings and palapa roofs, tastefully outfitted. Best of all were the people who staff the place. Top-notch breakfasts every morning, thorough and punctual cleaning and Emiliano was awesome, organising our day-trips to the Sayulita surrounds -for snorkelling/surfing etc. There was no request they couldn't attend, and everything was done quickly and cheerfully. The whole outfit was a great example of a relaxed but effective service ethic. Overall we had the best ever family resort holiday ever and Villa Valentin exceeded all our expectations. We miss the Margaritas already! Lived like a King & Queen!! We never wanted to leave!! This place is truly like no other in Sayulita or the surrounding areas. Not only is it privately nestled into it's own nook a quick 8 min. golf cart ride outside of town, but it has a superb group of staff that brought me to tears when it was time to go home after our 7 day stay. They were so attentive and helpful with any request or suggestion. They were kind and sincere, and made us feel at home immediately! We had 14 people staying with us, rented the main house and both casitas. The decor and ambiance in each room was clearly done with a true talent in interior design. It is modern, boho beauty! Everything has a simplistic yet thoughtful touch and you cannot help but feel special in every space of this property. I know it sounds a little over the top, but I honestly cannot say enough good things about our stay here!! We got married here, and had our reception here all on the grounds. It was absolutely flawless. We will be back, and hopefully every year, for as long as we can!! Much love to Emiliano, and Moises and all the wonderful staff at Vill Valentin. We miss you and thank you all again for all your care and love. We spent a week at Villa Valentin with 15 of our closest friends and family for the week and hosted our wedding for 50 people there as well. The Villa is amazing...the views, the rooms, the layout, the decor, everything! On top of that, the staff was fantastic. Emiliano was the best - he was always there and was super helpful. We can not wait to go back and spend more time at Villa Valentin! We had 15 family members from 1.5 years old to grandparents all had a fabulous time. The architecture is beautiful with lovely appointments and cozy corners to be by yourself or hang out . The photo do not lie this is a magical home. Now for the best part the people who work here are a delight from the manager, Brenna, to the night watchman. Friendly, helpful and well trained. Thanks so much for the review. I am so glad you all enjoyed your stay. Your family is wonderful, I am grateful to have hosted such a great family. Hope to see you all again soon.